Playa del Carmen is in the heart of the Yucatan peninsula, Mexico where the artifacts from the ancient Mayan culture met the exceptional natural wonders. Discovering all the highlights of the all-inclusive resorts takes time but this article may help you to find the best things to do in Playa del Carmen. A submarine tour around one of the top diving sites in the world – Cozumel, is definitely worth a visit. The Mexican Island is located just opposite the Playa del Carmen resort. The area is a popular tourist destination known for the exceptional scuba diving and snorkeling around the second largest coral reef in the world. For me, as a person who does not swim at all, it was thrilling cruising the Chankanaab reef and exploring the unique underwater world of Cozumel. 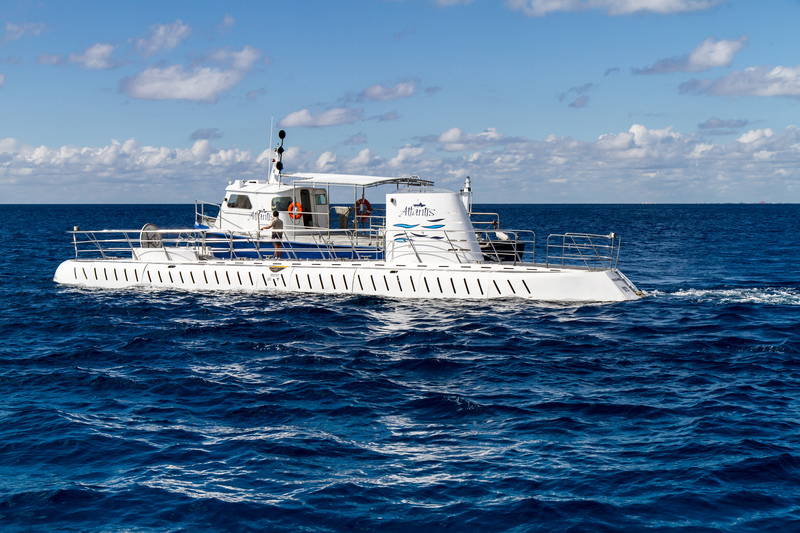 The expedition with the submarine Atlantis XII is one of the most adventurous experiences when you are on a vacation in Playa del Carmen, Playacar, Isla Mujeres, Tulum or Akumal. We did this trip a few years ago. We booked a tour costing $130 per person. The expedition targeted the western coast of the island. Our submarine excursion started at the port of Playa del Carmen where we took a ferry to Cozumel. The journey took less than an hour. When we reached the main town on the island – San Miguel de Cozumel, we headed to the Atlantis office which is relatively close to the ferry dock. As the journey started, we were able to explore exotic fish, corals, underwater mountains and caves. We all enjoyed the creatures and natural landscape under the water. I was able to see things I haven’t spotted since I am not a swimmer. The reef system is a natural habitat for lobsters, vibrant anemones, neon-colored fish, turtles, nurse sharks, crabs and squid. Of course, we managed to see only a small part of this abundant marine life. The ride took us to the Great Cozumel Wall. This amazing trip was even more exciting for our 9-year old child. When we went to the depths of 100 feet, some of the colors started fading. We were overwhelmed with the changing colors of the scenery – red was the first to disappear, followed by yellow. Some passengers claimed that the vessel shook once but I personally did not notice any change in its motion. The submarine glided around the reef and we were sitting in comfort. There were viewports for all the passengers. Maybe the main downside of the vessel was that there were no bathrooms on board. When the expedition finished, we had time to explore the island of Cozumel. Swimming with sea turtles in Akumal bay is an activity you could do for free. This is one of the most exciting things to do in Playa del Carmen, Mexico. Snorkeling with giant sea turtles is an amazing experience! The easy access to the green turtle’s natural habitat in the shallow waters of Akumal is a popular choice for tourists. From mid-May to mid-September, the marine creatures lay their eggs in the sand and raise their babies. During the nesting season volunteers collect scientific data and protect the nests. Giant sea turtles prefer Akumal bay because they feel safe and eat the sea vegetation that grows on the sandy bottom. The marine creatures can be found in Akumal bay all year round. They can be seen close to the coral reef – at 30-60 meters out into the sea. The good features of this attraction are that the turtles are not kept there but come voluntarily. with a little more looking you may easily find one or two sea turtles swimming by. furthermore you get to swim with the turtles for as long is you can follow them. To get in touch with the amazing nature and sea turtles, you have to pay only for transportation from Playa del Carmen to Akumal bay. If you bring with you your own snorkeling equipment, you do not have to rent it on the beach. Akumal is a small town on Yucatan’s east coast – 65 miles (100 km) south of Cancun and 20 miles (34 km) from Playa del Carmen. It is located north of Tulum. Instead of paying about $100US per person for an organized excursion, we rented a taxi from Playacar. In January 2016 they charged us 800 Mexican pesos (40 USD) for a round trip from Playa del Carmen to Akumal. The price included 2-3 hours wait. Each additional hour is charged at 200 Mexican pesos. This was a very low cost excursion compared to organized tours. Since we were 3 persons, taking a taxi was the most convenient way to get from Playa del Carmen to Akumal. We personally combined swimming with sea turtles in Akumal Bay with snorkeling in Yal Ku lagoon which is at a 5 minute drive from the central beach. We paid in pesos because we got a better rate. Many tourists advise to get a shared van or collectivo taxi from Playa del Carmen to Akumal. Yes, it is significantly cheaper but very time-consuming. It would take 30 minutes walking from the stop on the highway to the beach. We got there at 11 a.m. and the water was clear and calm. The barrier, where the waves broke was just off shore. The world’s second largest reef was so close to the shore that we thought we could swim to it from the beach. We did not have flippers but strongly recommend using them because turtles are very fast. We got lucky and spotted two sea turtles. Actually, we managed to swim closely to only one of them. We got very close to the turtle. This creature was very big! Six years ago we saw sea turtles during our Sian Ka an tour and had never imagined we would swim with one of them in their natural habitat. Getting up close to sea turtles was the time of our lives!It was an unforgettable experience. We also saw colorful fish wandering through – angelfish, lionfish and barracuda. We felt as we had found the best thing to do in Playa del Carmen. We did not spend much time enjoying the beach of Akumal but it was not a big deal since there were crowds of people. The beach was not organized and the only shadow was under the few palm trees on the shore. Akumal is a perfect spot for snorkeling. The picturesque bay which is metres from the Mesoamerican reef is a tropical paradise. 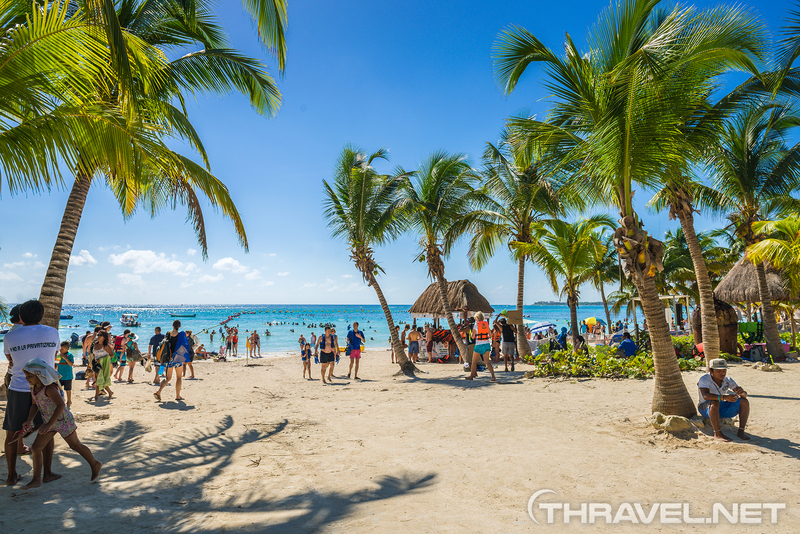 When in Playa del Carmen or any other place in Riviera Maya, this beach is a must-see. 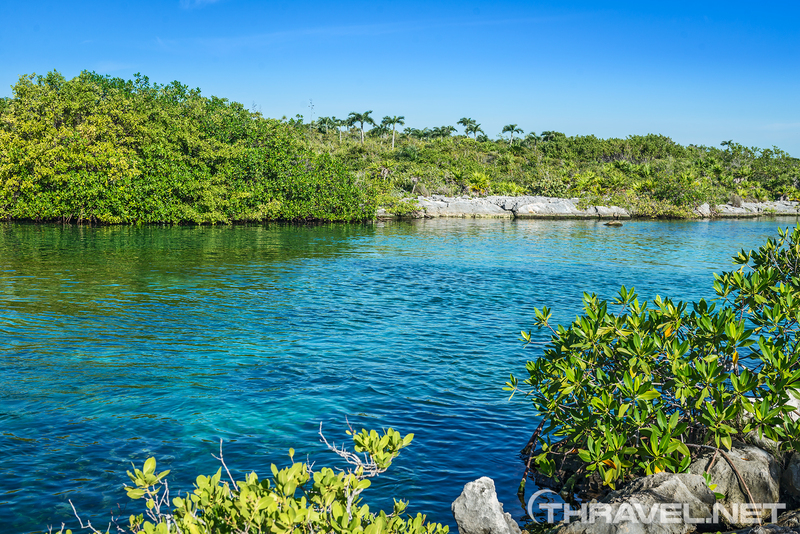 A perfect day in the area also includes visiting one of the natural wonders near Akumal. As spectacular as Xel-Ha theme park but considerably cheaper, Yal-Ku is worth visiting. It is located about 3 miles from Akumal bay. The lagoon features islands with mangrove trees and waters where the marine life thrives. The water is relatively clear since underground rivers with fresh water travel via the lagoon. This considerably affects the transparency of the water since the fresh water mixes with the salt water and makes it appear as if gelatin was poured in it. It was gloomy. A quick visit to Yal-Ku makes a lot of sense but this activity is for people who swim well. This new and exciting experience was something we did not do before. The underwater currents are very strong so we recommend using snorkel gear and flippers. it was hard to resist the currents by swimming without flippers as you were being dragged very quickly from one side to another. We got in touch with great tropical fish and marine creatures. Yal-Ku is still a hidden wonder. Choosing it as a stop for your trip helps you in avoiding the annoying crowds of tourists typical for themed parks. Tourist agents in Playa del Carmen and Playacar do not advertise it. At the beginning of January 2016, which is a top season in Mexico, there were no more than 15 swimmers in the area. We could enjoy the swim and the nature! We and the other visitors were not allowed to use sunscreen nor to bring any food. The entrance fee for Yal-Ku is 15 USD per person. Compared to the prices in Xel-Ha theme park, this place is a better option. Of course, you have to pay more if you do not bring your own equipment. If you plan a combined excursion to Akumal bay and Yal-Ku, consider one hour for the natural lagoon. 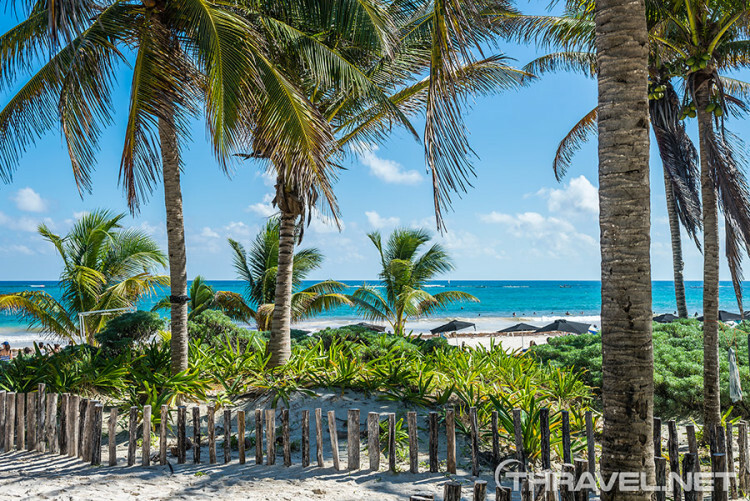 Tulum, Mexico was the first Maya city discovered by the conquerors. It was a major port on the Mayan trade routes. Now the town and its beaches are ultimate stop for tourists. We have always dreamt about experiencing the charm of the beach below Tulum archaeological site. During our first visit in Mexico, we did not manage to see it but this time, at the beginning of 2016, we decided to witness its beauty. Instead of visiting the ruins, we wanted to see only the beach. We were hoping to admire the seaside view without paying an admission for the castle. For our journey to the ancient time we had already chosen Chichen Itza and Ek Balam which are considered the most interesting Maya complexes in Yucatan. So, we took a taxi from Playa del Carmen to Tulum. When we got there, we realized that we could only reach the famous beach as part of a tour of the Tulum ruins. Yet, we decided to stroll to the path around the archaeological site and find the nearest beach. We were told that there are dozens of beautiful beaches around Tulum. We had to walk 30 minutes to the first one which was the nearest to the ruins. Hundreds of people were trying to do the same, walking along the path. We hoped that we could see the most emblematic beach below the ruins from there. Unfortunately, it was too far. We saw people who were trying to reach it through the rocks but it was almost impossible to do it. 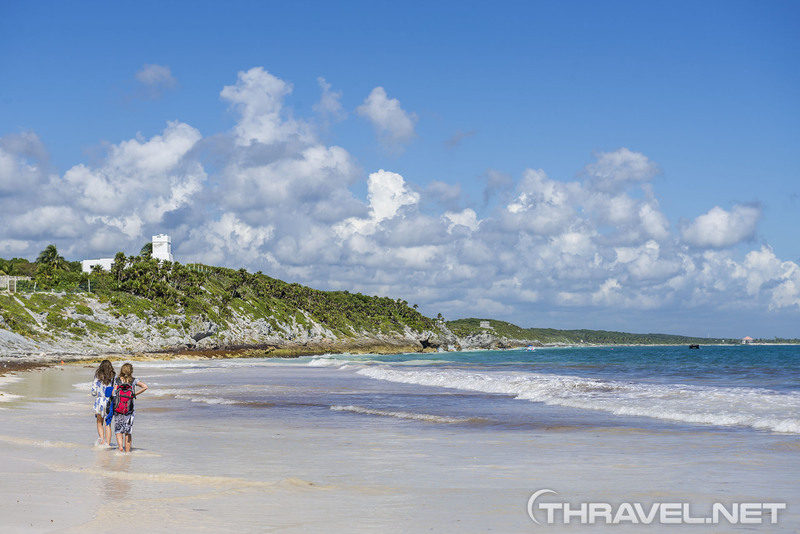 The beach of Tulum was ample with white sand glittering under the clear tropical skies. Unfortunately, these days even here, the water of the sea was muddy. Yet, the place was beautiful and the setting was spectacular! On our way back to the parking, we took a train. We paid 20 Mexican pesos (about 1 USD) per person. There are many tourist agencies organizing tours to Tulum and Xel-Ha. The price is 149 USD per person. We combined our Tulum excursion with a visit to Akumal. Therefore, the total price for three persons was 1300 Mexican pesos (71 USD). As we already mentioned, taking a collective bus is considered the most inexpensive way to travel in Mexico but bus stops are far from the main tourist spots. That is why we do not recommend walking an hour under the scorching Mexican sun to get to the Tulum beach. Playa del Carmen offers good shopping options either on the central 5th Avenue or on surrounding streets. 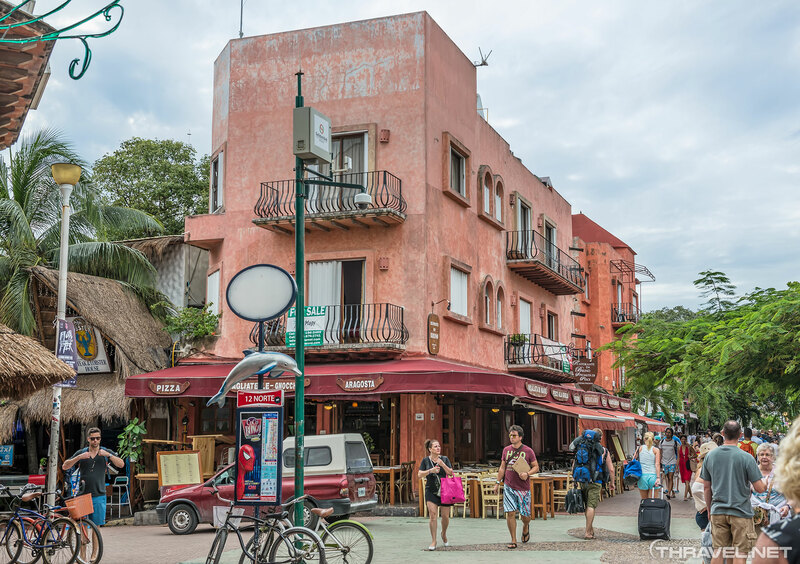 Whether you walk or take a taxi from Playacar to Playa del Carmen, Paseo del Carmen is the first stop for shopaholics. It is the nearest spot where tourists staying in the upscale hotel zone can shop brands such as Guess, Tommy Hilfiger, Pandora, Zara clothes and Zara home, Nine West and many more. The shopping mall features nice places to eat or have a drink like Sushi Itto and Starbucks. In the complex, you can find free public restrooms. After Paseo del Carmen shopping mall, the iconic 5th avenue begins. On the right side is the Cozumel Pier and the beach of Playa del Carmen. There are hundreds of shops where you can buy anything you want – from typical Mexican souvenirs to fine jewelry. For the most demanding people there is a big shopping center Quinta Alegria on the corner of 5th Avenue and (16th Street) Calle 16. The souvenirs and gifts you buy in Playa del Carmen should say something unique about the Mexican culture and traditions. Here are some tips on how to choose the most valuable items. The cacao has been cultivated more than 5000 years ago by the civilization of olmecas. They even believed in a Cacao God (Ek Chuah). Since then, Cacao or “brown gold” has been a symbol of abundance and wealth. We tried a chocolate with 62 per cent cacao coffee flavoured chocolate and it was very delicious. The price was between 4-7 USD per unit. We wanted to buy natural cacao but did not find it anywhere. Silversmithing has centuries worth of traditions in Mexico. The high-quality precious metal comes from the Taxco silver-mining center. The design of the handy crafted jewelry is inspired by ancient symbols and pre-Columbian motifs. On each piece there is a 925 stamp indicating the quality. Almost everywhere in Playa del Carmen the prices of the jewels can be negotiated down. Traditional ceramic items are made by hand using ancient techniques. There are colorful Mexico-themed pieces like salt and pepper pots, mugs, vases, bowls, and plates. We loved the sophisticated mix of pink, yellow, blue and violet on the pottery. Tequila is available in liquor stores in Europe and the United States, but there are plenty of local brands that are worth buying from Playa del Carmen. If you ask local people, the best tequila is Herradura “Seleccion Suprema”. Still, the most popular is ”Jose Cuervo”. You can find a variety of tequilas for reasonable prices in supermarkets in Playa del Carmen. We checked out one of the global brand stores – Walmart. If you wish to buy tequila, jalapeños, sweets and coffee, this is the best place. It is a 5-7 minute walk from 5th Avenue. You can save at least 1/3 from the price there. What else? Well, there are many things you can bring back home – mini or regular sombrero, coffee, atrapasueños, textile and more. After a day of shopping in Playa del Carmen, you can taste French cuisine in Byblos and Chez Celine restaurants. La Bodegiuta del Medio serves Cuban specialties. Nikkori is a Japanese restaurant. You can taste Italian pasta in Da Bruno, Di Vino and Rolandi’s. One of the most interesting places is Frida Kahlo Bar. It offers Mexican dishes, seafood, and meat.